River island is always one of my favourite sales. It always starts online first which I much prefer and let’s be honest online shopping is so handy. River island have started there foot wear sale, I’ve a few pair of river island shoes and find the quality amazing. Silly season as I like to call it, is just about to start and lets be honest it’s nice to have a new outfit for Christmas parties. River island have 40% off party wear at the moment, so its the perfect time to pick up a new outfit. Its Christmas so we have to start with a sparkly dress and this green sequin dress it perfect it was was €55 now €33 click here to buy . If you are not a fan of skirts or dresses this black velvet outfit is perfect the trousers wore €45 now €25 click here to buy the top was €29 now €20 click here to shop . If you prefer a nice top and jeans combo this gold sequin top is perfect it was 47 now 25 click here to shop . The River Island show sale has started, I’d say the main sale will start this week to. I love sale’s and I would say I check the River island sale section nearly every day, just to see if there is anything new added. This week I did buy a jumpsuit in petite, I love when I find a jumpsuit in petite as I don’t have to pay extra to get it taken up it was €94 now €30.00 . I am always telling people to check the River Island sale section regularly, as they add items to it and if you order now you will get it in time for Chrismas. Also you might find the perfect gift for a loved one. Another tip is if you get it delivered to the shop there is no delivery charge. River Island Devet set in double was €55.00 now €18.00 click here to buy , they also have it in single was €40.00 now €12.00 click here to buy . Any teenage girl would love this, sure I would love it now for my bedroom. Grey check bow dress was €87.00 now €30.00 click here to buy . Silver bow dress was €87.00 now €30.00 click here to buy . Grey roll neck slogan jumper and it was €55.00 now €24.00 click here to buy . Black Friday is the 24th November this year and I can’t wait. I love getting a discount or a sale item, it just makes shopping more fun. 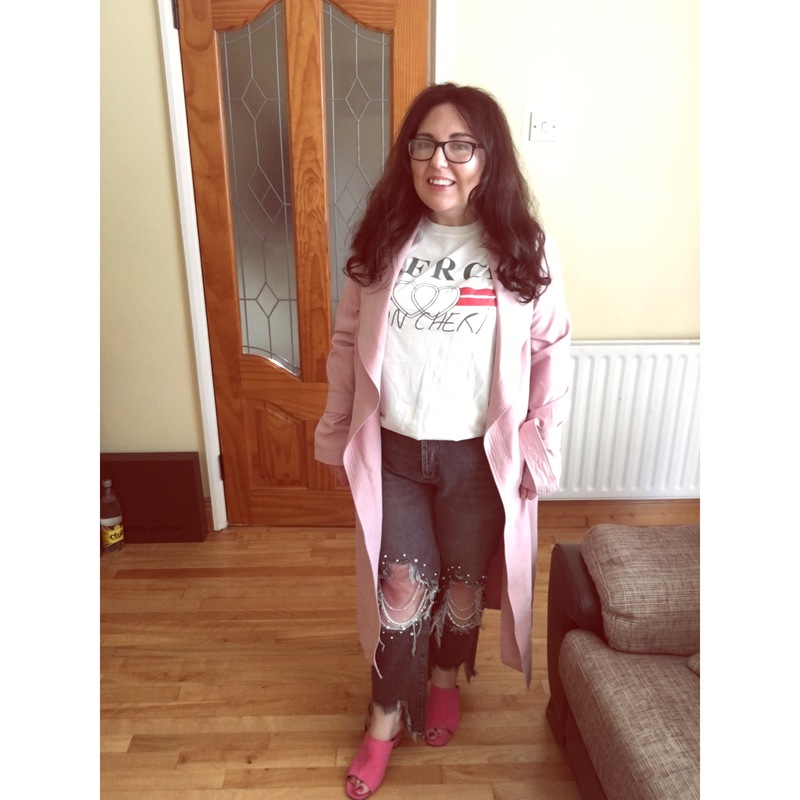 River Island have started a black friday warm up sale today, its perfect time to get your christmas outfit sorted and here are my top picks. As I said in my last post I am having a love affair with pink at the moment. Everything I seem to pick up lately is pink, I showed you my star buy last month a duster coat from penneys. I have styled it with river island pearl jeans I got on sale and topshop tshirt and my new pink penneys shoes.